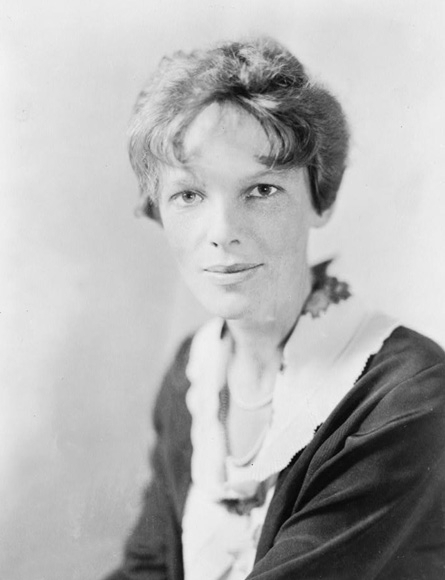 Amelia Earhart was a famous Aviator from USA, who lived between July 24, 1898 and July 2, 1937. She became only 38 years old. She was an American pilot who became famous through a series of bold long-haul flights and pushing for women would be given the same opportunities as men to be trained in aviation. She graduated from Hyde Park High School in Chicago 1917th Two years later she went as a volunteer nurse at a military convalescent hospital in Toronto. 1920 began a preparatory course for the training of doctors at Columbia University in New York but completed it. After a first flight with trainer Frank Hawks, she took lessons for flight teacher Neta Snook, bought his first airplane, a Kinner Airster, and set an unofficial altitude record for women of 4200 meters. In June 1928 Earhart flew the first woman across the Atlantic in a Fokker F.VII with pilots Wilmer Stultz and Louis Gordon at the controls. The landed safely Wales after 20 hours and 40 minutes. Earhart was celebrated, became well known in America and Europe and could then devote himself entirely to flight. She took part in races, set a record of various kinds, received awards and made ​​the following long-haul flights: in May 1932 from Newfoundland to Paris, but landed in Northern Ireland. In August 1933 Los Angeles to Newark, New Jersey. In January 1935 the Pacific Ocean from Honolulu, Hawaii, to Oakland, California in April of that year from Los Angeles to Mexico City. Started in March 1937 a round the world flight west from Oakland but had to stop after an incident in Honolulu. Started again in June from Miami, Florida, this time eastward and disappeared without a trace at the leg from Lae in New Guinea to Howland Island 2 July 1937. She is born under the zodiac leo, who is known for Ruling, Warmth, Generosity, Faithful, Initiative. Our collection contains 19 quotes who is written / told by Amelia. "Women, like men, should try to do the impossible. And when they fail, their failure should be a challenge to others"
"Women must try to do things as men have tried. When they fail their failure must be but a challenge to others"
"Women must pay for everything. They do get more glory than men for comparable feats, but, they also get more notoriety when they crash"
"There is so much that must be done in a civilized barbarism like war"
"There are two kinds of stones, as everyone knows, one of which rolls"
"The woman who can create her own job is the woman who will win fame and fortune"
"The most difficult thing is the decision to act, the rest is merely tenacity. The fears are paper tigers. You can do anything you decide to do. You can act to change and control your life; and the procedure , the process is its own reward"
"The more one does and sees and feels, the more one is able to do, and the more genuine may be one's appreciation of fundamental things like home, and love, and understanding companionship"
"Please know that I am aware of the hazards. I want to do it because I want to do it. Women must try to do things as men have tried. When they fail, their failure must be a challenge to others"
"Obviously I faced the possibility of not returning when first I considered going. Once faced and settled there really wasn't any good reason to refer to it"
"Never do things others can do and will do if there are things others cannot do or will not do"
"In soloing - as in other activities - it is far easier to start something than it is to finish it"
"I want to do it because I want to do it"
"Flying might not be all plain sailing, but the fun of it is worth the price"
"Courage is the price that life exacts for granting peace"
"Better do a good deed near at home than go far away to burn incense"